Erich Pearson is no stranger to planting cannabis. As the CEO of SPARC and a longtime marijuana activist, he’s spent years farming pot indoors, outdoors and in greenhouses. But with his feet in the warm dirt of Sonoma Valley, even he’s a little choked up about what’s happening. “The is the first time planting in the ground,” he says, watching staffers from his San Francisco-based cannabis farming and dispensary company tuck foot-high starts into neat rows. The goal: The first ever biodynamic certified cannabis farm in California. 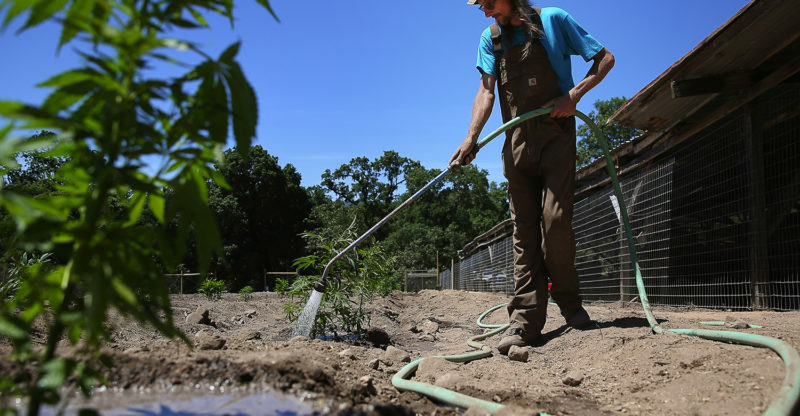 On a sunny June day just outside of Glen Ellen, Pearson is cautiously optimistic about the project even though there’s nearly a month before the county will accept official permit requests for cannabis farms. With help from Mike Benziger, a leader in biodynamic farming in the local wine industry, it’s one of Sonoma County’s first toe-dips into sustainably farming cannabis—an under-the-radar crop only now being subjected to responsible agricultural standards. Indoor-grown cannabis and many greenhouse-grown cannabis crops are typically planted in containers using amended soil to better control growth and pests. It is relatively rare to see cannabis grown in actual dirt, according to Pearson. Biodynamic farming takes organic farming to the max, using only natural processes to fertilize, grow and avoid pests, along with various spiritual and holistic practices. That means utilizing weed-eating animals and their manure, encouraging biodiversity and using birds and insects to control crop damage. And cow horns buried on a full moon. Benziger has been a long-time advocate for biodynamic farming at his former wineries, Benziger Family Winery and Imagery Winery. Ironically, it’s been reported that the Glen Ellen ranch he bought in the 1980s was a former pot farm in the 1960s, with vines as a cover crop. Under giant ponderosa pines, Benziger helped Pearson’s team on three test plots in the Valley of the Moon and continues to work with SPARC toward Demeter Biodynamic certification. “I have believed in the biodynamic model for a long time. I have seen it work in the wine business. To have Erich embrace this type of farming with his cannabis could create a whole new prototype for how that crop is farmed in America,” Benziger said. 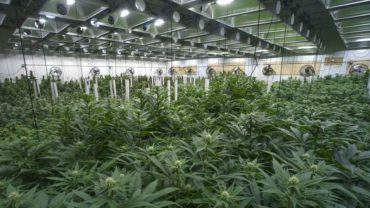 Though other more easily-controlled growing processes are the norm, Pearson hopes to showcase the farm as a “sterling example of responsible, sustainable, cannabis farming,” he said. It’s also a chance to truly showcase “terroir” or a sense of place where the cannabis is grown. Marijuana appellations, similar to wine AVAs (American Viticultural Areas), have already been proposed, but if cannabis is grown indoors, in greenhouses or pots, is it really of the local terroir? “The potential is virtually unlimited. When you plant seeds in the ground, each plant is a bit different. They send out tap roots that ingest minerals and water from the soil providing a unique terroir influenced product. The cannabis grown on our biodynamic farm will be the equivalent of a Reserve wine from a winery,” he said. Pearson said he hopes to have about 100 different varieties of cannabis on the property, including strains like Durban Poison, Headband, Puna Budda Cookies and Rollins. SPARC submitted a permit application to Sonoma County on July 5, the first day permits were accepted, and is in the midst of finalizing the paperwork, according to Pearson. “I understand the importance of working with the government, the public entities in Sonoma County and neighbors in Sonoma Valley to explain what we are doing and how this new, biodynamic farm venture will contribute to and enrich the community,” said Pearson. Leaders in the wine and weed world will meet up at the first Wine and Weed Symposium on August 3 in Santa Rosa.